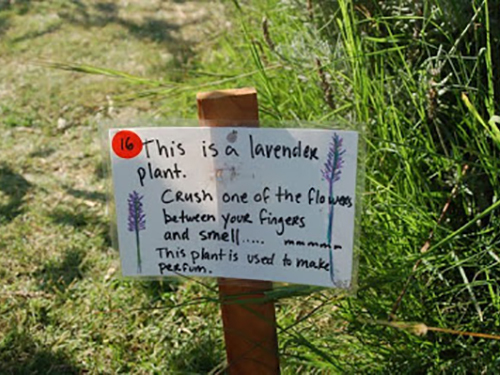 In this 6th grade introductory lesson, students first encounter the garden as a classroom. They meet the garden staff, tour the garden, learn the basic systems and routines of the garden classroom, and are introduced to the Edible Schoolyard culture and expectations for learning in an outdoor setting. Students work together in small groups to explore the garden, pose questions and make discoveries. Welcome students and introduce the Edible Schoolyard garden program. Explain that the Ramada is part of the garden classroom. It is where all garden classes will begin and end with an opening and closing circle. Remind students about the Respect In the Garden poster (shared in the previous lesson) and introduce the job board as a place where students can look to find out what’s happening each day in garden class. Reference the job board – have students call out what the activity of the day is and briefly explain that today’s activity is essentially a tour of the garden. Finally, introduce the cowbell as the signal to finish activities, clean and put away any tools, and head back to the Ramada for Closing Circle. Divide students into smaller groups and begin the card hike. Each small group of students starts at various points along the hike, allowing each group to participate in the activity simultaneously with enough space between. Frame the card hike by telling students that this activity will give them the opportunity to see many of the systems and infrastructures in the garden. It will also orient them to space. Ideas for the garden name game. "Look for something garden related that starts with the same letter of your first name – e.g. Maiesha Mushroom..."
A place in the garden that they would like to return to and explore in depth after the structured card hike activity. To play, Students introduce themselves by their first name followed by a word associated with the garden that begins with the same letter (Simona Sunshine, Isaiah Iceberg Lettuce, and so on...). Ask students to think back on the card hike and recall the names of plants, animals, or other various aspects of the garden. This reflection will be helpful in participating in the name game activity. If someone is stuck and can't think of a garden name in the moment, ask students to help out their fellow classmate by taking suggestions, so that the person giving their name has options to choose from. As students share their garden name, foster engagement by having everyone repeat the name. This helps us all to learn the names of our classmates. Tell students that when they return to the Ramada, they will have the opportunity to share their garden name with the entire class by participating in the Whip-Around activity. Frame the students’ 10 minutes of self-guided exploration time. Explain that they will have an opportunity to go anywhere in the garden that they would like to further explore. Explain that they will need to report back what they discovered, by bringing one question and one observation back to the closing circle. Welcome students back to the Ramada and lead them through the Whip-Around activity. 1. Garden teachers and students share their garden names and one of their observations or questions. Highlight behavioral expectations as you reintroduce the Respect in the Garden poster. Make sure that multiple learning styles are used, including visual aids, interactive team-building games, listening and speaking, reading and verbal communication. This helps ensure that every student receives a similar experience. Students can learn about the garden as they explore the space and read the series of cards. The cards created for this activity should also emphasize the biodiversity of plants and animals in the garden as well as the concepts of ecosystems and care for the natural world. Providing opportunities for each student to read is a great way of increasing student talk time and the use of academic language. Encourage students to focus on listening, speaking, and following directions. Introduce the concept of foraging and identify potential crops that students can eat without asking. This helps foster a sense of ownership with their school and school garden. Encourage students to sample crops like ground cherries, tomatoes, lemon verbena, and mint. Place an emphasis on using their five senses. Students are encouraged to explore on their own with one hope – that they fall in love with the space. ESY students and teachers create an atmosphere of cooperation and unity. We elevate the class experience for all by offering and receiving encouragement, and welcoming the ideas and contributions of others. ESY students and teachers notice and appreciate beauty. We take ownership in pleasing and awakening our senses to communicate care and value, because beauty can deliver a message of optimism and expectation without saying a word.